Dr. Garret FitzGerald (Irish: Gearóid Mac Gearailt) (9 February 1926 – 19 May 2011) was an Irish politician who was twice Taoiseach of Ireland, serving in office from July 1981 to February 1982 and again from December 1982 to March 1987. FitzGerald was elected to the Seanad Éireann in 1965 and was subsequently elected to the Dáil as a Fine Gael TD in 1969. He served as Foreign Affairs Minister from 1973 to 1977. FitzGerald was the leader of Fine Gael between 1977 and 1987. 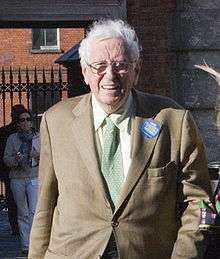 Garret FitzGerald was born in Dublin in 1926 into a very politically active family. His mother Mabel McConnell Fitzgerald was involved in politics and it was through her that his father became political. Desmond FitzGerald was London-born and raised. He was Minister for External Affairs at the time of his son's birth. FitzGerald senior, whose father had emigrated as a labourer from Skeheenarinky in County Tipperary, had joined the Irish Volunteers in 1914 and fought during the 1916 Easter Rising. Desmond FitzGerald had been active in Sinn Féin during the Irish War of Independence, and had been one of the founders of Cumann na nGaedheal. The party was formed to support the Anglo-Irish Treaty of 1921, which created the Irish Free State. Although a senior figure on the pro-treaty side of Ireland's political divide, Desmond FitzGerald had remained friendly with anti-Treaty republicans such as Belfast man Seán MacEntee, a minister in Éamon de Valera's government, and father-in-law of Conor Cruise O'Brien. The families of Patrick McGilligan and Ernest Blythe were also frequent visitors to the FitzGerald household. FitzGerald's mother, the former Mabel Washington McConnell, was a nationalist and republican of Ulster Protestant descent, although some sources indicate that she became a Catholic on her marriage. Her son would later describe his political objective as the creation of a pluralist Ireland where the northern Protestants of his mother's family tradition and the southern Catholics of his father's could feel equally at home. Garret FitzGerald was eager to enter politics, and it was suggested by several members of Fianna Fáil, including Charles Haughey and Michael Yeats, that he should join that party. Ultimately FitzGerald made his entry into party politics under the banner of Fine Gael. He attached himself to the liberal wing of Fine Gael, which rallied around the Just Society programme written by Declan Costello. FitzGerald was elected to Seanad Éireann by the Industrial and Commercial Panel in 1965 and soon built up his political profile. FitzGerald was elected to Dáil Éireann at the 1969 general election, for the Dublin South-East constituency, the same year he obtained his PhD for a thesis later published under the title "Planning in Ireland". He became an important figure almost immediately in the parliamentary party and his liberal ideas were seen as a counterweight to the conservative leader, Liam Cosgrave. Difference in political outlook, and FitzGerald's ambitions for the Fine Gael leadership resulted in profound tensions between the two men. In his leadership address to the 1972 Fine Gael ard fheis in Cork, Cosgrave referred to the 'mongrel foxes' who should be rooted out of the party, a reference seen by many as an attack on FitzGerald's efforts to unseat him as leader. Two fundamental problems faced FitzGerald during his first period: Northern Ireland and the worsening economic situation. A protest march in support of the H-Block hunger strikers in July 1981 was harshly dealt with by FitzGerald. On one occasion where he met with relatives of the hunger strikers, he refused to meet the family of Bobby Sands, a MP for Fermanagh and South Tyrone and O/C of the Provisional IRA hunger strikers, and the first to die on this strike, along with the sister of Raymond McCreesh, who had died on 21 May. During the meeting, two of Thomas McElwee's sisters, Mary and Nora, broke down and left the meeting. Mary McElwee stated to the media outside that "he's doing nothing, he's asking for suggestions". Fitzgerald then ordered Gardaí to remove the families from the meeting. Fitzgerald's response was, in the words of Eamonn Sweeney, to "lay all the blame for the hunger strikers on the Republican movement and to suggest an immediate unilateral end to their military campaign". The economic crisis was also a lot worse than FitzGerald had feared. Fine Gael had to jettison its plans for tax cuts in the run-up to the election and a draconian mid-year budget was introduced almost immediately. The July Budget seemed exceptionally austere for a government dependent on Independent TDs support. However, the second budget introduced by John Bruton led to the Government's shock defeat in Dáil Éireann on the evening of 27 January 1982. Viewing his defeat as a loss of support, FitzGerald went to Áras an Uachtaráin to request an immediate Dáil dissolution from the President, Patrick Hillery. When he got there, he was informed that a series of telephone calls had been made by senior opposition figures (and some independent TDs), including Fianna Fáil leader (and ex-Taoiseach) Charles Haughey, Brian Lenihan and Sylvester Barrett demanding that the President, as he could constitutionally do where a Taoiseach had 'ceased to retain the support of a majority in Dáil Éireann', refuse FitzGerald a parliamentary dissolution, forcing his resignation as Taoiseach and enabling the Dáil to nominate someone else for the post. The President is said to have angrily rejected such pressure, regarding it as gross misconduct, and granted the dissolution. In the subsequent general election in February 1982, Fine Gael lost only two seats but were out of power. However, a third general election within eighteen months in November 1982 resulted in FitzGerald being returned as Taoiseach for a second time, heading a Fine Gael-Labour coalition with a working majority. When FitzGerald attended a meeting of the Bilderberg Group in 1985, his rival Charles Haughey suggested it had links with NATO, thus contravening Ireland's official position of neutrality. He was buried at Shanganagh Cemetery. ↑ "State Funeral for Garret FitzGerald". RTÉ News. 20 May 2011. ↑ Alan S. Cowell (19 May 2011). "Garret FitzGerald, Ex-Irish Premier, Dies at 85". The New York Times. ↑ "Dr. Garret FitzGerald". Oireachtas Members Database. Retrieved 30 May 2010. 1 2 "Obituary: Irish statesman Garret FitzGerald". BBC News. 19 May 2011. Retrieved 21 May 2011. 1 2 "Garret Fitzgerald – Political obituaries". The Telegraph. 19 May 2011. ↑ "Garret FitzGerald". The Economist. 26 May 2011. ↑ "The Bar Council of Ireland | Law Library". Lawlibrary.ie. Retrieved 19 May 2011. ↑ Davison, Phil (20 May 2011). "Obituary: Garret FitzGerald, politician, economist and journalist". The Scotsman. Edinburgh. ↑ "Garret FitzGerald". ElectionsIreland.org. Retrieved 30 May 2010. 1 2 3 4 "Dr Garret FitzGerald dies in a Dublin hospital aged 85". Independent (Ireland). 19 May 2011. Retrieved 21 May 2011. ↑ "Impact of Ireland on EU policy". European Union. Retrieved 21 May 2011. ↑ Moody, Theodore William; Francis X. Martin; Francis John Byrne; Art Cosgrove (2005). A New History of Ireland, Vol. 7: Ireland, 1921–84. Clarendon Press. ↑ McDonald, Henry (26 February 2011). "Fianna Fáil trounced as Fine Gael and Labour set to form coalition". London: The Guardian. Retrieved 21 May 2011. ↑ Sweeney, Eamonn (1 January 2010). Down Down Deeper and Down: Ireland in the 70s and 80s. Gill & Macmillan. p. 231 – via Google Books. ↑ "Noonan attends annual conference of Bilderberg group". The Irish Times. 2 June 2012. Archived from the original on 8 June 2015. ↑ "Referendum on the right to life of the unborn (1983)" (PDF). Department for the Environment, Heritage and Local Government. p. 32. Retrieved 21 May 2011. ↑ "Queen pays tribute to former Taoiseach Garret FitzGerald". Belfast Telegraph. 20 May 2011. Retrieved 21 May 2011. ↑ "Garret FitzGerald". Irish Times. 20 May 2011. ↑ "Garret FitzGerald dies aged 85". RTÉ News. 19 May 2011. ↑ "A courageous and visionary taoiseach". The Irish Times. 19 May 2011. ↑ "President hails FitzGerald as Renaissance man". RTE. ↑ "Leaders pay tribute to former taoiseach". Irish Times. 19 May 2011. ↑ "'Intelligent, wise and amusing man'". Irish Times. 23 May 2011. ↑ "A man of great integrity who was devoted to service of State". Irish Times. 20 May 2011. ↑ Ed Carty and Colm Kelpie, PA (19 May 2011). "Queen offers sympathies following FitzGerald death". The Independent. London. Retrieved 19 May 2011. ↑ "Five at Five". News Talk. 19 May 2011. Retrieved 19 May 2011. ↑ "'A great leader of the Irish people'". Irish Times. 19 May 2011. ↑ "State Funeral for Garret FitzGerald". RTE. ↑ Cambell, J. (2014). Roy Jenkins: A Well-Rounded Life. London: Jonathan Cape. p. 522. ISBN 9780224087506. ↑ "Letters - The Irish Times". Irish Times. Wilsford, David, ed. Political leaders of contemporary Western Europe: a biographical dictionary (Greenwood, 1995) pp 139-44.